You are invited to Judy Torres 'NO REASON TO CRY' Off-Broadway show! The show sold out June, July, and tickets are selling fast for August. We are proud to announce that Flaco Coquito our chamber member has partnered with Rebecca's Sweets & Spices will be sold at the NRTC Lounge. SAVE THE DATE. September 15, 2018, The 4th Annual Hudson Valley Fiesta Latina at Museum Village. We know - You have been waiting with bated breath! It's going to be another fabulous event where we celebrate Family, Faith & Country. WEPA! Ruben Estrada Rosie Otero-Walsh Barbara Martinez #hvfiestalatina2018 - Have a question? Email us at hudsonvalleyfiestalatina@gmail.com. The 2018 USHCC National Convention! This is the largest gathering of Hispanic business leaders in America. Each year, we bring together local Hispanic Chambers of Commerce, Hispanic business leaders, and corporate partners, to foster Hispanic economic development for greater American economy. This year’s conference will take place September 16th through 18th at the Philadelphia Marriott Downtown. The USHCC is thrilled to host the 2018 National Convention in the “City of Brotherly Love,” Philadelphia, Pennsylvania. Philadelphia is home to a thriving Hispanic community as well as many historic landmarks including Independence Hall and the Liberty Bell. We are proud to bring our signature events to the city—such as the Chamber Awards Breakfast, Women in Leadership Luncheon, ERG Summit, and Business Matchmaking—as well as new programs and networking opportunities. We hope to see you in Philadelphia this September! The USHCC Website Click Here! The NYC LGBTQS Chamber of Commerce is proudly partner with DBGM Inc. 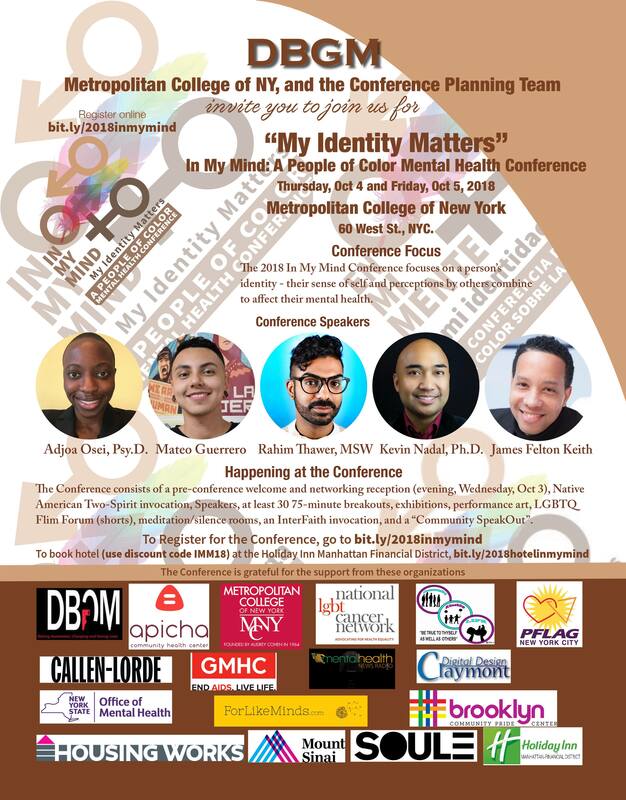 The collective efforts of the planning team for this two-day conference will focus on how LGBTQ+ peoples of color see themselves and how these perceptions influence and affect their mental health. The collective strengths and wisdom of clinicians, consumers, academics, and advocates confront the issues affecting identity constructs in these communities, especially in light of the policies and rhetoric from the current Administration and against the backdrop of conservative religious belief systems. Both days will begin with presentations to establish common starting points, which will be followed by concurrent single/stand-alone, small group workshops, and panel discussions – some geared for clinicians and others for community members. At the end of the second day, we will have a "Community Speak Out", where conference participants will have a chance to express their thoughts on the necessary next steps for improving this conference and addressing the mental health of LGBTQ+ people of color. SIGN & SHARE PETITION TODAY!